Nothing, it seems, stirs up emotions like talking about our personal pasts with Walt Disney World. While we all saw and experienced the same corners of EPCOT Center or the Magic Kingdom in our formative years, it is amazing how differently we remember those moments and places. Speaking for myself, I feel as if I always have one eye pointed towards the past and one eye towards the future, just as it seems Walt Disney did. Unlike Walt, however, I tend to lose sight of the present occasionally. In Roll, bounce and float, I tried to imprint my memories of transportation in and around the parks into a meaningful wish for the future. With articles such as this one, I try to give words to those who fondly remember something from Walt Disney World and wish for the best tomorrow it can have, but are unable to find the words themselves. I hope you have all heard a bit of yourselves in the Main Street Gazette this year, and I promise to keep speaking up for all of us in 2012! There is a hustle and bustle in the Magic Kingdom. It is the huddled masses crushing in upon one another, trying to get from one place to another as quickly as possible, and before someone else in the same crowd can. This massive throng of humanity, also known as park attendance, increases each year, but once upon a time there was a different feel to the park due, in part, to the continual inclusion of transit. Let’s step back to the late 1970s and early 1980s to gain a bit of perspective. For starters, we are not talking about the illusion of movement, such as Mission to Mars, or rides that occur in darkened buildings, including If You Had We Wings. No, we want full on motion, going somewhere, being a part of something on the move! Main Street, U.S.A. alone featured seven types of transportation: Plaza Swan Boats, Jitney, Fire Engine, Horse Carriage, Horse Cars, Ominbus and the Walt Disney World Railroad. Adventureland had the Jungle Cruise and Frontierland Big Thunder Mountain Railroad, but those were more about what you were seeing or being a rollercoaster than about being a form of transportation. The Rivers of America was really active, and included Rafts to Tom Sawyer Island, Davy Crockett’s Explorer Canoes, Mike Fink Keelboats and the Liberty Square Riverboat. In Fantasyland, we had one half of the Skyway and methodically moving Nautiluses of 20,000 Leagues Under the Sea, while Tomorrowland’s transit included the WEDway PeopleMover and the other half of the Skyway. Depending on how you account for the Skyway (with each station allowing only a one way trip, I’ll go ahead and count it as two attractions), that is fifteen attractions devoted to transportation. These days, many of these attractions have been retired: Plaza Swan Boats, Davey Crockett Explorer Canoes, Mike Fink Keelboats, both stations of the Skyway, 20,000 Leagues Under the Sea and one of the Liberty Square Riverboats. The Main Street vehicle brigade is all but a distant memory. They each make their occasional appearance motoring up and down Main Street, with the most frequent being the Horse Car, but these appearances are so rare that I made sure to get myself photographed with the omnibus (my personal favorite of the Main Street vehicles) when I saw it out around Easter this year, as I didn’t know when I would receive another chance. So, where are we on the vehicle count? We still have a PeopleMover, Rafts to Tom Sawyer Island, the infrequent Main Street vehicle, Liberty Square Riverboat, and the Walt Disney World Railroad, barely a third of what traveled through the park at the pinnacle of moving attractions. Now, I am aware of the liability of putting a driver in charge of safely navigating down Main Street, U.S.A., through thousands of oblivious guests, ferrying about other antsy guests, and possibly dealing with an unruly horse (we all have our days, and this is a worst-case scenario) or springing a leak and ordering guests to bail out into the Rivers of America, not knowing who can and cannot swim. Yet, it seems to me, the Magic Kingdom could do with a little more movement around its waterways and avenues. It is well past the time to put the Main Street vehicles back into regular service. Think of how idyllic the Plaza could look with graceful watercraft, perhaps not swan boats but possibly a modified gondola equipped to hold more guests. The Rivers of America is meant to resemble a water highway, constantly ferrying goods and people along, not a sleepy river with the sporadic boat churning through. Boats piloted by guests, while the epitome of interactive, could cause some problems. However, adding a second riverboat that adds some diversity to the river, an ironside comes to mind, while not putting the control in guests’ hands would get the river flowing again. I understand I have a rose-colored view of Walt Disney World from my youth, but I also like to think of what might be down the road, and then come to a happy medium in the middle. As a people, we are supposed to learn from our mistakes, but our successes are just as critical to our continued achievement. 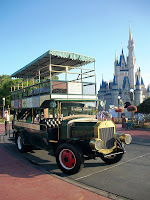 Yet, the Magic Kingdom has regularly syphoned away the vehicles that gave it life and personality. While the park may not have heeded how well the water and land craft brought a sense of vitality with them, there is still time to come about face and put a few more wheels in motion.